From Walt Disney Pictures and Jerry Bruckheimer Films comes Pirates of the Caribbean: Salazar's Revenge, the fifth film in the now iconic Pirates of the Caribbean film franchise, which returns Johnny Depp to his Academy Award-nominated role as the outrageous, swashbuckling antihero Captain Jack Sparrow. Depp is joined in this new adventure with Oscar winners Javier Bardem and Geoffrey Rush, and cast members both new and familiar to Pirates of the Caribbean fans. With the release of Pirates of the Caribbean: The Curse of the Black Pearl back in 2003, came the dawn of Jerry Bruckheimer’s most successful franchise, one of the most successful series of films in the history of the Disney Studios. The film series was to become a game-changing, culture-altering, zeitgeist-boosting, history-making phenomenon, with the first film followed by Pirates of the Caribbean: Dead Man’s Chest (2006), Pirates of the Caribbean: At World’s End (2007) and Pirates of the Caribbean: On Stranger Tides (2011). Collectively, these four films have brought in over $3.7 billion of worldwide box-office, but more importantly, inspired and delighted audiences of all ages around the globe. 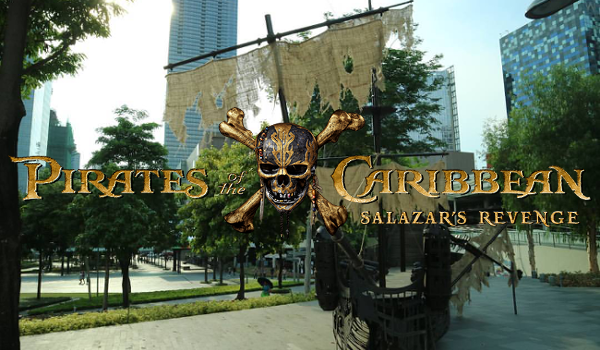 Now, the rip-roaring Pirates of the Caribbean: Salazar's Revenge, finds down-on-his-luck Captain Jack feeling the winds of ill-fortune blowing strongly his way when deadly ghost sailors, led by the terrifying Captain Salazar, escape from the Devil's Triangle bent on killing every pirate at sea—notably Jack. Jack’s only hope of survival lies in the legendary Trident of Poseidon, but to find it he must forge an uneasy alliance with Carina Smyth, a brilliant and beautiful astronomer, and Henry, a headstrong young sailor in the Royal Navy. At the helm of the Dying Gull, his pitifully small and shabby ship, Captain Jack seeks not only to reverse his recent spate of ill fortune, but to save his very life from the most formidable and malicious foe he has ever faced. In addition to Johnny Depp, who was most recently seen in Fantastic Beasts and Where to Find Them, Pirates of the Caribbean: Salazar's Revenge stars Academy Award winner Javier Bardem (No Country for Old Men, Skyfall), Brenton Thwaites (Maleficent), Kaya Scodelario (The Maze Runner films), Kevin R. McNally (Pirates of the Caribbean franchise), Golshifteh Farahani (Paterson), David Wenham (300: Rise of an Empire), Stephen Graham (Pirates of the Caribbean franchise) and Oscar® winner Geoffrey Rush (Pirates of the Caribbean franchise). The screenplay for the new adventure is by Jeff Nathanson (Catch Me If You Can, Indiana Jones and the Kingdom of the Crystal Skull). The executive producers are Mike Stenson, Chad Oman, Joe Caracciolo, Jr., Terry Rossio and Brigham Taylor. Behind-the-scenes talent includes director of photography Paul Cameron (Collateral, Déjà Vu), production designer Nigel Phelps (Pearl Harbor, World War Z), costume designer Penny Rose (all four previous Pirates of the Caribbean films), Academy Award-winning hair and makeup designer Peter King (all six The Lord of the Rings and The Hobbit films), editors Roger Barton (Pearl Harbor, Bad Boys II) and Leigh Folsom Boyd (Fast & Furious 6, Furious 7), visual effects supervisor Gary Brozenich (an Oscar nominee for The Lone Ranger who previously worked on Pirates of the Caribbean: On Stranger Tides), stunt coordinator Thomas Robinson Harper (Marvel Studios’ Guardians of the Galaxy, The Jungle Book) and Emmy Award-winning composer Geoff Zanelli, who worked closely with Hans Zimmer on all four previous Pirates of the Caribbean films.